TTCal - A calibration routine developed for the OVRO LWA. TTCal is a calibration routine developed for the OVRO LWA. The standard procedure for phase calibrating a radio interferometer usually involves slewing a small number of large dishes to stare at a known point source. A point source at the phase center of the interferometer has zero phase on all baselines, so phase calibration essentially amounts to zeroing the phase on all baselines. Low frequency telescopes (<300 MHz) tend to occupy an entirely different region of phase space. That is they are usually composed of numerous cheap dipole antennas with very broad beams (LOFAR, MWA). Furthermore, the low frequency sky is corrupted by propagation through the ionosphere. Until the field matures, the demand for a new and effective calibration technique is best met by a simple, adaptable, and relatively fast software package. This is why I wrote TTCal. Figure 1. 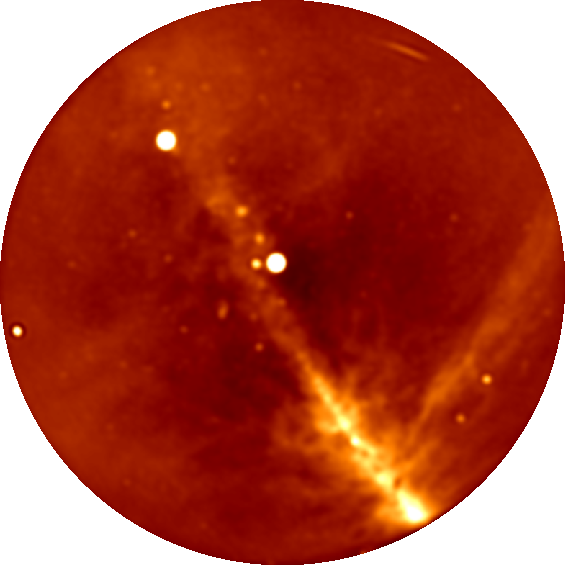 An OVRO LWA snapshot image made using data calibrated exclusively with TTCal. TTCal requires version 0.4 of the Julia programming language. Julia is a dynamic language designed for scientific computing with a just-in-time compiler based on LLVM. The syntax should be familiar to users of Matlab and Python, but Python users should be aware that the first element of an array is accessed with x.
TTCal depends on the CasaCore.jl package, which is a Julia wrapper of the casacore library. It is used to interface with measurement sets and perform coordinate conversions. If all the tests pass, you are ready to begin using TTCal. gaincal     Solve for a gain calibration. polcal      Solve for a polarization calibration. peel        Peel sources from the dataset. shave       Shave sources from the dataset (wideband peeling). Note that every time Julia is restarted there is overhead associated with reloading and recompiling the code. While Julia version 0.4 introduced code caching to help mitigate this, running TTCal will always be faster from a Julia script than from the command line. TTCal expects data to be provided as a measurement set. Furthermore each measurement set must contain only a single spectral window and a single time integration. If you encounter any problems or errors, please open an issue on Github. Known problems are listed as open issues. If you have any questions after reading through this documentation let Michael know by opening an issue on Github.